In doing research for my recent blog about the impact of the Richard Diebenkorn "Ocean Park" exhibition at The Orange County Museum of Art (OCMA), I discovered something noteworthy in the public response to the show. During my three visits to OCMA I had noticed that the galleries were unusually hushed, and that people were taking their time, lingering in front of the paintings. Slow looking, rather like the intense scrutiny a painter might give his or her own work during the course of its creation, was very much in evidence. Author Peter Clothier, who has observed that museum goers spend an average of six seconds in front of a painting, came to OCMA to facilitate one of his "One Hour/One Painting" workshops. Clothier gathered small groups to sit in front of individual Diebenkorn paintings for an hour. He then asked his participants to meditate on the works, with their eyes alternating between open and closed. 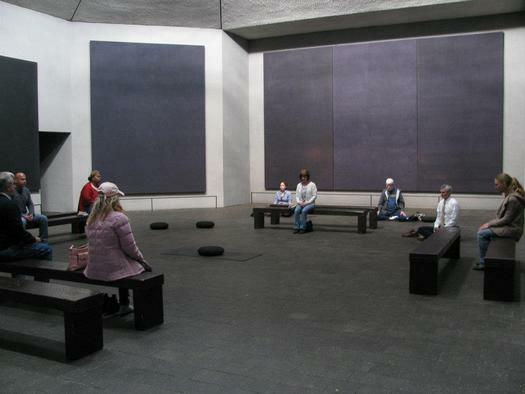 Zen poet Peter Levitt, who contributed an essay to the "Ocean Park" catalog, later facilitated a standing meditation and writing workshop for museum docents. "I gave them ways to see them not with their eyes," says Levitt. Richard Diebenkorn, who was famously down-to-earth, would have likely been puzzled by the idea of people "meditating" on his works, and most art museums are conceived with the idea that shows should present well-lit paintings to crowds of visitors who will be chatting with each other, or listening to docent talks and audio tours. Meditation, especially silent meditation, seems to belong in temples, ashrams or memorial chapels. "The Rothko Chapel is here for people every day; it is such a gift," states Emilee Whitehurst. "The world today needs many more Rothko Chapels," wrote a visitor in chapel's comment book in July, 1994, and the world seems to be getting more. Not far from the Rothko Chapel, James Turrell's new "Twilight Epiphany" at Rice Univesity provides seating for 120 people who can observe changes in the sky in a contemplative fashion. It is one of 25 "skyspaces" that Turrell has created across the world in the past four decades. The Board of Trustees of Stanford University recently approved $4.2 million dollars for the construction of the "Windhover Contemplative Center," due to open in 2014, where visitors will "rest in quiet reflection" in the presence of four paintings by the late Nathan Oliveira. Unlike Rothko's Houston murals - which are abstract - Oliveira's large canvases are semi-abstract, and feature images of wings and horizons that connect with the vision of a soaring falcon in Gerard Manley Hopkin's poem "The Windhover: To Christ our Lord." Although Oliveira was raised Catholic, his "Windhover" paintings reflect a spirituality that is poetic and responsive He told Stanford Magazine in 2002, when discussing his series that "a painting is also a vehicle. I set it up to the degree that it gives you something recognizable to interact with, and if you're creative, you create your own metaphor." Stanford already has a church, the glorious Italianate "Memorial Church" that has survived two major earthquakes, so to some, having a contemplative center might seem redundant. Of course, strictly speaking a church is for prayer, and prayer is directed to God. Modern art, whether seen in a museum or a contemplative center is meant to direct people inward, not outward. Meditation, and "mindfulness" are for an emerging generation who call themselves "spirtual but not religious." Then again, maybe meditation and prayer are closer than one might expect. Buddhist author Phillip Moffitt equates Christian "prayer" with Buddhist "intention," and Buddhist "mindfulness" with Christian "observance." Whatever the case, it appears that there is a growing trend to see modern art -- especially abstract art -- as a spiritual gateway.